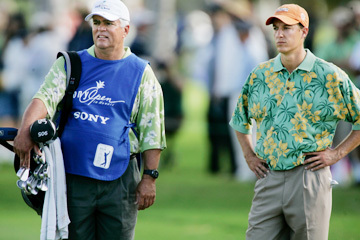 Scott Simpson says he learned from caddying for Parker McLachlin in the Sony Open. You wouldn't think being a caddy for a week at Waialae would result in a fast start at Turtle Bay, but that's exactly what has happened for Scott Simpson. Two weeks ago, Simpson caddied for Parker McLachlin at the Sony Open in Hawaii and learned a thing or two more about that special relationship. When asked if that helped him prepare for the Turtle Bay Championship, he thought it did. "Because Parker is working with this sports psychologist Don Green," Simpson said. "And they're working on some things I think have helped me so far. They want to get the caddy involved, especially because I was caddying. Yeah, we talked over the shots and things. "I'm doing that more with my caddy than I normally do. I think it has been good. Parker went out there with the clear intention, we talked about it beforehand, that he would tell me where he was aiming, every shot and verbalizing what he's trying to do. I asked Don about that and why it helped. It kind of frees you up and helps you focus." It seems to be working for Simpson, who is alone in second entering today's final round of the first full-field event of the Champions Tour. He trails Loren Roberts by four shots and will need some fancy visualizing to catch his fellow 50-year-old. "Parker was doing that and I really liked it," Simpson said of telling him where he was aiming and what he hoped would happen with the shot. "I'm trying that too and it seems to be working." Simpson eagled the first hole of the tournament from the fairway and laughed about hitting his first iron shot so well. "It worked right off the bat," Simpson said of visualizing his approach to the first green. "I think it did help because I really like what Parker is working on and it reminded me of a few things I could work on, too." No defense: Hale Irwin is not going to successfully defend his Turtle Bay Championship title for the first time in the 21st century. The winningest golfer in the history of the Champions Tour opened his defense on Friday with an un-Irwin-like 1-over 73. As surprising as that was -- it was only the second time he had a round over par since the tournament shifted to Turtle Bay in 2000 -- yesterday's 5-over 77 was downright shocking. Irwin has not managed a birdie the first two rounds and currently sits in a tie for 57th place at 6-over 150. He didn't score 150 last year until the third shot on the fifth hole of the final round. "Right now I'm not a very good player," a terse Irwin said on The Golf Channel. "There's nothing in my game that's worth talking about. You know, that's the game. You take your lumps, but I'll be back. This has been a particularly tough week simply because I was so looking forward to being here. My play has not been very good at all." The 60-year-old Arizona resident, who has won this tournament an unprecedented five consecutive times, will leave Hawaii behind and hopefully find himself when the Champions Tour resumes in Florida. "What I need to do is get back to some basics," Irwin said. "I've been trying so hard just to make a birdie that I think I've kind of pushed things a little bit. I just need to get back to the fundamentals, do the things I do well. If the birdies come, they come. "To play 54 holes without a birdie (including the pro-am on Thursday) is pretty difficult. But what I'm looking for is a slingshot into Florida. Get a couple of weeks' break, get to Florida and kind of get back to the game that hopefully I still have." Inside the numbers: Roberts is 37 under through his first 90 holes on the Champions Tour. That figure includes one eagle, 40 birdies, three bogeys and one double. He's either led or shared the lead in four of those five stellar rounds. Since Roberts recorded a 2-over 73 in the final round of last year's U.S. Senior Open, he has managed 19 consecutive rounds of par or better on the Champions Tour It looks good for Roberts to win this event. In the previous 18 tournaments here, dating back to when this event was on Maui, the players leading or tied for the lead after two rounds have won 10 times, including six of the last nine. When told that R.W. Eaks said the only way Roberts won't win this tournament is if he doesn't show up, Roberts said, "You won't hear me saying that." Perhaps, but a four-shot lead is pretty hard to let slip away, especially when you're playing as well as Roberts. Curtis Strange made the best move up the leaderboard yesterday. His 5-under 67 left him at 2-under 142 for the tournament. He went from a tie for 56th on the first day to a tie for 17th yesterday. That's an eight-stroke, 39-spot swing. The scoring average yesterday was 72.833, down slightly from the opening-round average of 73.218. There were 25 rounds under par yesterday compared to 15 on Friday. The most difficult hole was the par-4 10th with a scoring average of 4.346. The easiest was the par-4 14th with an average of 3.744. The second-hardest hole was the par-4 second at 4.115, and that despite an eagle by Bart Bryant, who also birdied the first hole en route to a second-round 69.